This year I promised myself I’d take better care of myself. I want to treat my body like a temple and be good to myself both inside and out. The first place I started was by chucking away all the products that were full of chemicals that were bad for me and I started reading up on the good stuff. All the little things I could do (that required the least effort) to help me look my best. 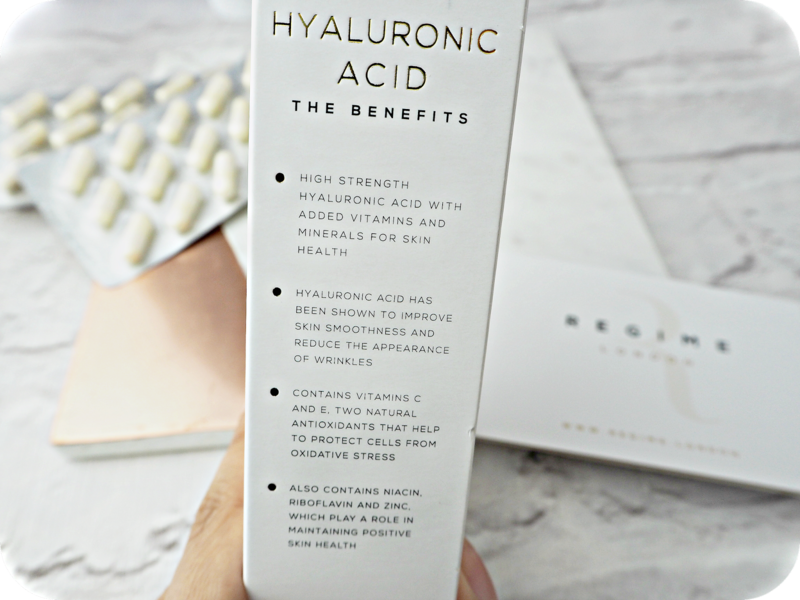 Not so long ago I read about how great Hyaluronic Acid (HA) is for you. It’s unique because it helps to retain water and strengthen the skin’s barrier, both of which are fantastic to hear for those of us with anti ageing concerns. I’ve read countless articles that say they also help smooth out your skin which would be another bonus for me because I’m so desperate to get rid of my acne scarring. About a month ago, Regime London got in touch with me and asked me how I felt about working on beauty on the inside out. In all honesty, I hadn’t thought about it. I mean I know water is great for your skin, and vitamins are great but I never thought of taking actual beauty supplements. I try all these beauty products on my skin, so it would be mad not to consider trying something that worked on the inside. I decided to give them a go and see what I thought. Regime kindly sent me a box of 30 capsules to try. They come in a small box which is easy to store. I love the clean white and gold branding. There’s something luxe about it that gives me some confidence in trying them out. The first thing I noticed was that the capsules are huge! I wasn’t sure if I would be able to swallow them and I started fretting a little bit. It wasn’t too bad in the end. As recommended, I took the capsule once a day with a full glass of water. Luckily they didn’t leave a bitter after taste so it was relatively painless. It’s pretty obvious that the capsules are so big because they’re packed with vitamins, minerals and antioxidants to help improve skin smoothness and texture. Each serving provides 100% of your daily requirement of zinc as well as vitamins B2, B3, C and E. Pure goodness really. I checked the ingredients and the first ingredient is Hyaluronic Acid from soya. I was a little bit surprised to see soya on there so I decided to ask my fave friend Google for some insight into this. It turns out that Soy is actually fantastic for promoting hyaluronic acid.in the skin. Quick side note, eating fruit and veggies also help produce natural HA in the body & skin! 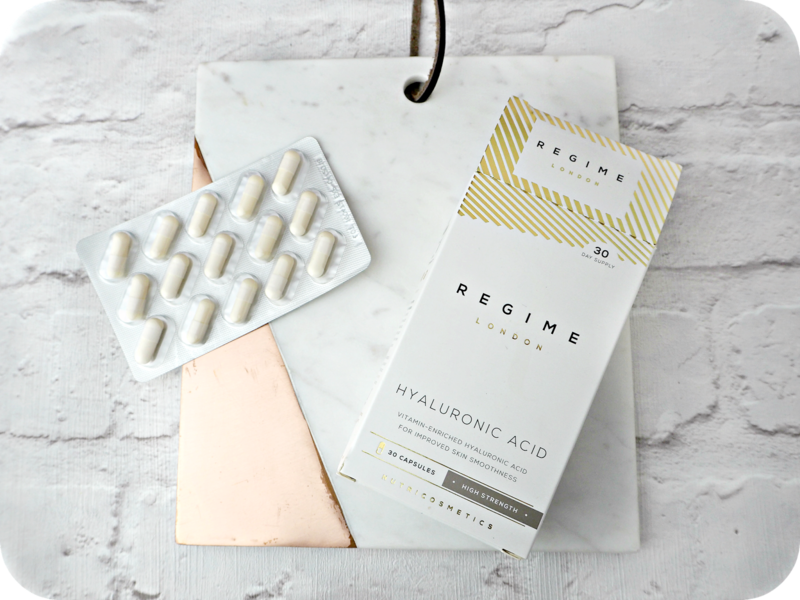 Research shows that a daily intake of 240mg of Hyaluronic Acid over a relatively short period of time there are visible signs of improvement to the skin’s smoothness. The average human body contains roughly 15 grams of HA, one third of which is degraded and synthesized on a daily basis. As we get older, these levels of HA also start decreasing which accompanies the ageing process – cue the fine lines and wrinkles! It’s estimated that by the time we reach our mid-40’s, the synthesis of Hyaluronic Acid is roughly half that required by the body. All this research got me really thinking and helped motivate me to keep on track with taking my capsules daily. It’s been 27 days that I’ve been taking the capsules and the only small change I’ve noticed so far in my skin is that the hollows under my eyes have become less…hollow. This could be because I’m sleeping more and generally making other small changes to my lifestyle, it’s too early to say. I’m intrigued by this product though and although I don’t have fine lines and wrinkles just yet, I’d like to see if they will help my scarring if I continue to take them. The capsules are available for purchase online and in Superdrug for £19.99. Considering you get a whole months supply, I think it’s totally worth it. I’ve already stocked up for the next three months! I’ll try and do a follow up on if I see any further improvement to my skin.